Fasting, which is practiced for a variety of reasons, includes fasts to cleanse, detoxify, lose weight, treat a medical condition and conform to religious practices. The type of fast you choose should be appropriate for your level of health, body chemistry and any special physical needs you may have. Before starting a fast, consult with your doctor or health care provider, especially if you are on any medications or have a serious health condition. A juice fast involves consuming liquids from fruits or vegetables only. No solid foods are eaten for a specified period of time, which can be anywhere from one day to two weeks. A juice fast is simple but requires some planning to ensure you get enough vitamins and minerals from a variety of fresh fruits and vegetables. Fruit and vegetables can be processed in a juicer, a blender or a food processor. A blend of fruit or vegetables is mixed with water and consumed three to six times daily. A water fast is very stringent and should not be implemented without consulting your doctor. Only pure water is consumed, around 2 qt. per day, notes the Salvation Army. The time varies depending on physical condition and goals. Medically supervised water fasts have shown success in normalizing blood pressure, notes an article published in the October 2002 issue of "Journal of Alternative and Complementary Medicine." Cleansing fasts use a liquid drink containing lemon juice, some form of simple sugar for calories and cayenne pepper or another spice. The idea is to cleanse the colon of food and toxins. The liquid is drunk 6 to 12 times daily. A more intense cleansing may use a laxative tea consumed twice daily, once in the morning and in the evening. Cleansing fasts can last from one to 14 days. Longer fasts should be supervised, and you should be aware of any symptoms of negative reactions. Partial fasts exclude a particular type of food such as rice, wheat or meats. A partial fast includes some solid food but can restrict the amount of food to less than one to three complete meals. Liquid protein fasts are typically used for weight loss in obese patients. Liquid protein diets can help people lose anywhere from 10 to 100 lb. but should be medically supervised, according to Dr. Edward Livingston, chief of GI/endocrine surgery at UT Southwestern Medical Center. Diagnostic fasts can be performed for a variety of testing purposes. 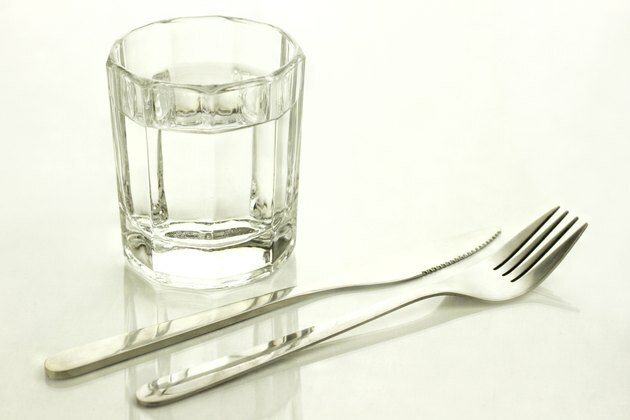 Diagnostic fasts require you to abstain from eating or drinking anything except water for eight to 12 hours prior to testing. As one example, a diagnostic fast is required before you take the fasting glucose tolerance test, which measures blood glucose levels to diagnose diabetes or hypoglycemia. Religious fasts are done for spiritual or ritual reasons. The Daniel Fast is modeled after the book of Daniel in the Bible. This is a partial fast restricting all foods except fruits, vegetables, grains and water for 21 days. The Jewish Tzomot includes seven different religious fasts throughout the year. Ramadan is an Islamic fast, lasting one month during which Muslims fast from sunrise to sundown.